I recently got my hands on the Imorden IR-02 Camera Shoulder Mount Rig. Having never used a shoulder mount, I wasn’t sure what to expect. Fortunately, I was pleasantly surprised at the multiple uses of this shoulder mount. The main reason that this rig interested me was the idea of being able to quickly mount my camera on a piece of equipment that would assist in stabilizing my shots. I already own a steadycam, which works very well, but it takes around ten minutes to get everything balanced. Often when I’m shooting video, I want to be able to put my camera on a tripod for something like an interview, then have the camera quickly available for steady, “on the go” type of shots. 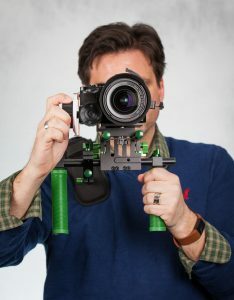 This shoulder mount rig gives me both of those options, as well as a surprising amount of other capabilities. 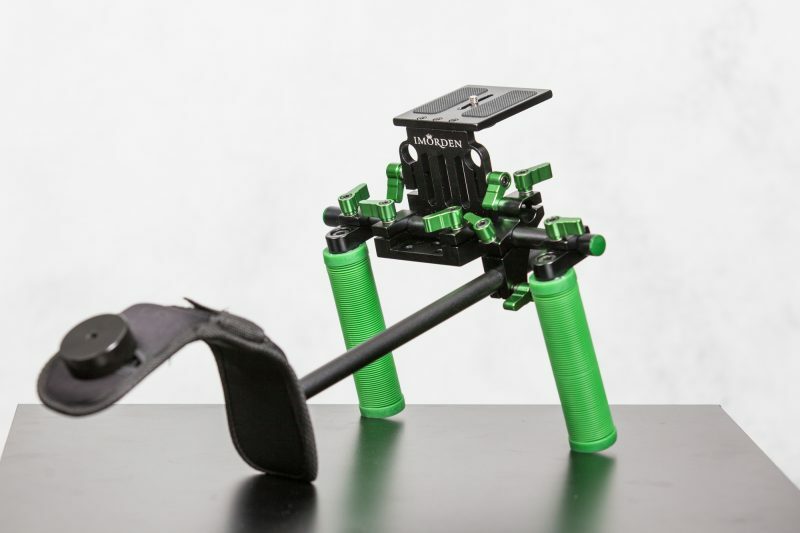 The shoulder mount is sturdy (made primarily out of aluminum) but also lightweight (weight without the counterweights is 4.25 pounds). 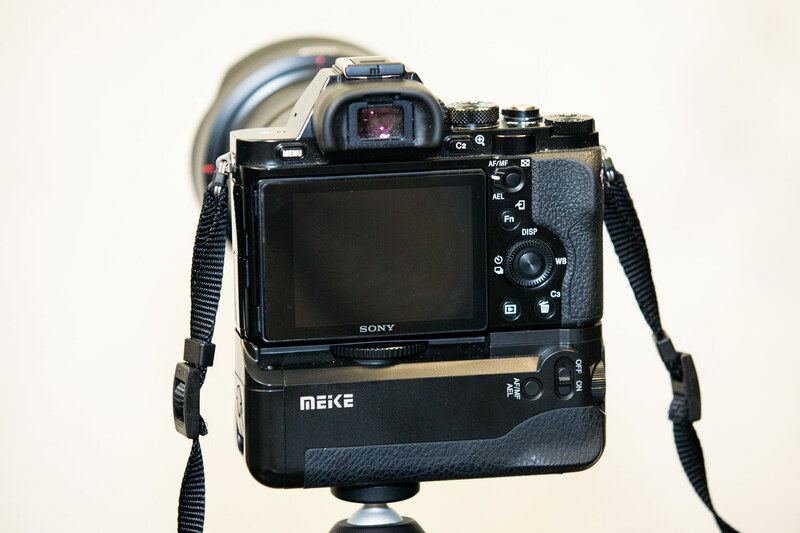 The shoulder mount can handle up to 13.2 pounds. 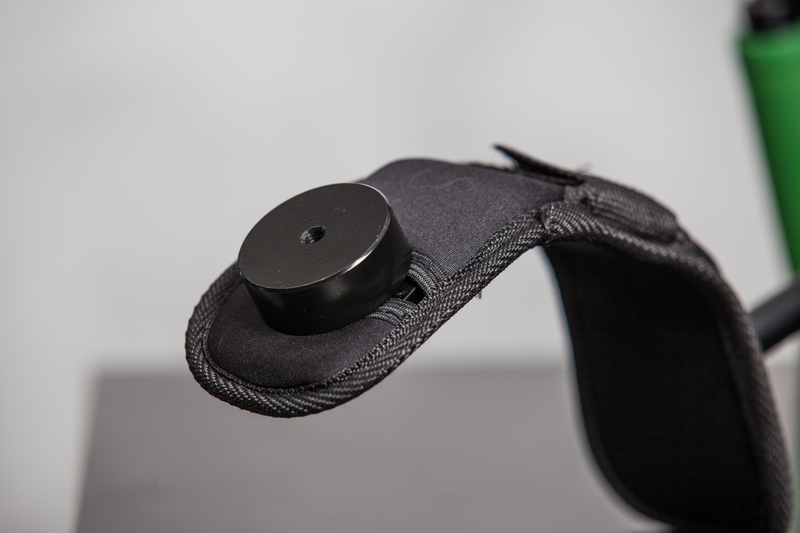 The shoulder mount ships with a standard 1/4″ thumb screw for attaching all kinds of photography gear to the plate. 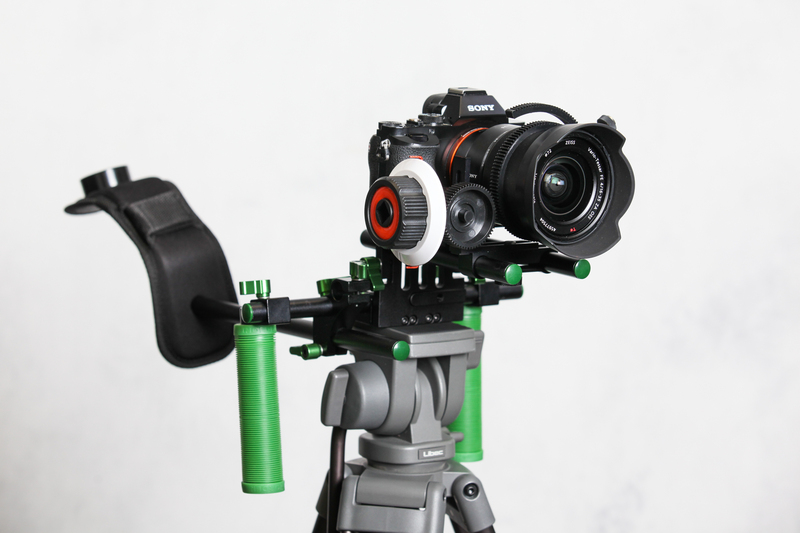 Also included are two standard 15mm rails (spaced 60mm apart), which allow you to attach any number of accessories to the shoulder mount rig. In all honesty, I’m more excited about the various possibilities of the 15mm rail system than anything else. Just a few ideas would be using a follow focus, attaching a teleprompter, attaching a matte box, or purchasing a micro mount with a cold shoe spud, which would allow you to attach all kinds of things including a flash or a wireless mic receiver. For my 15mm rails, I bought a follow focus to use with the rig and had it attached and working in a matter of minutes. Imorden also provided two extra wing bolts and a micro fiber cleaning cloth (they seem to send a cleaning cloth with most of their products). 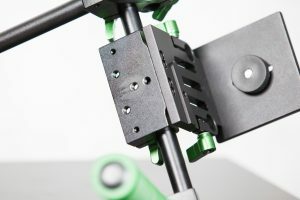 The only piece of equipment that you don’t receive with the shoulder rig that you will probably need for full functionality are counterweights. 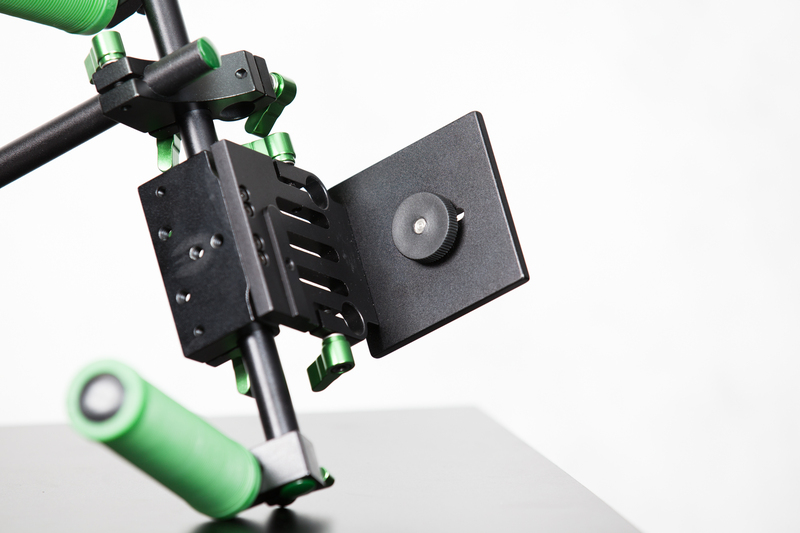 The counterweights assist in balancing the rig and counterbalancing the weight of the camera. The amount of counter weights you need depends on the weight of your camera. You can pick up two 200g weights from Amazon for $20. The shoulder mount is easy to set up and adjust, using wing bolts for the majority of the adjustable pieces (such as the hand grips). To quickly and easily attach your camera to the mounting plate, Imorden included a nice, large thumb screw. Imorden IR-02 quarter inch mounting screw. 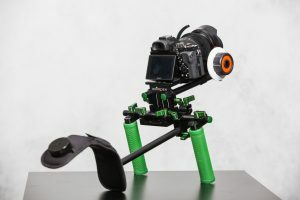 The rig also includes four 1/4″ holes on the bottom which allow you to attach the rig to a tripod, plus attach other accessories such as a friction arm (which would allow you to attach more devices, such as another camera, a microphone etc). Imorden IR-02 quarter inch holes. The obvious use of the rig is what the name implies – mount your camera and use your shoulder and the provided hand grips as a means to stabilize the camera. If you add something like a viewfinder, you get another point of stabilization (as the camera would be resting against your head, basically). Adjusting the shoulder mount to your liking is easy with the use of the wing bolts, and I especially like the amount of mobility that I’m afforded, especially when compared to a steadycam. I can more easily pan left and right and even tilt the camera up and down. It might not be quite as “fluid” a shot as what you’d get with a steadycam, but it’s still much steadier than if I were just holding the camera with my bare hands. The hand grips are also comfortable – they actually remind me of my old BMX bike that I had when I was a kid. What is perhaps more exciting than just “shoulder mounting” the rig are the options you are afforded by using the 15mm rail system. As mentioned above, the use of the industry standard 15mm rails allows me to attach any number of accessories. 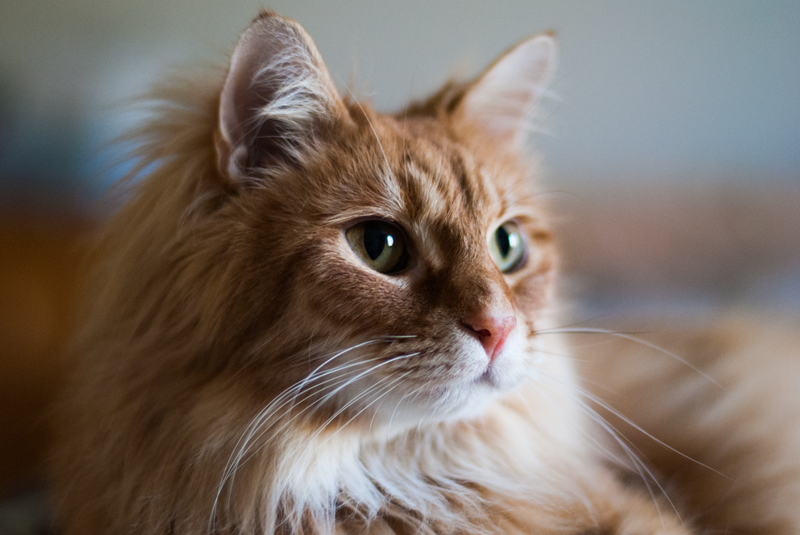 In my case, I bought an inexpensive follow focus and actually attached it to the zoom ring on my lens (instead of the focus ring). Doing so allowed me to easily get nice, smooth zooms in my footage. 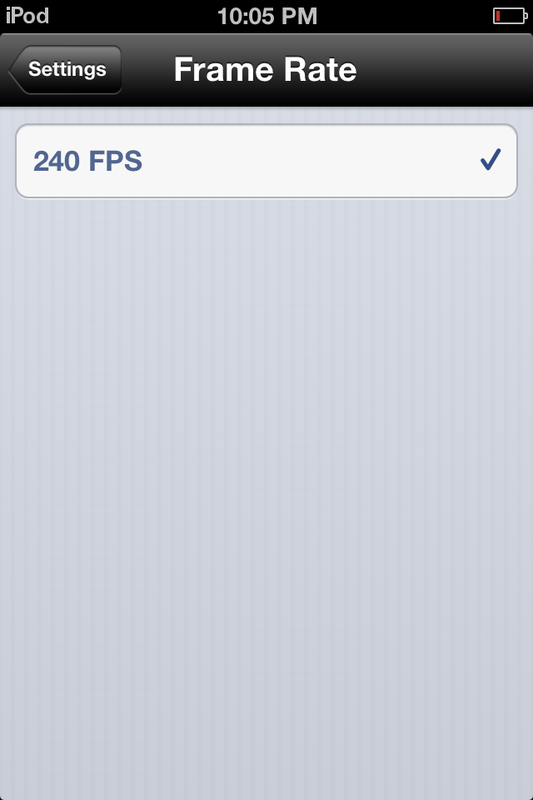 In the past I would rarely try zooming my camera when shooting video because it looked terrible. 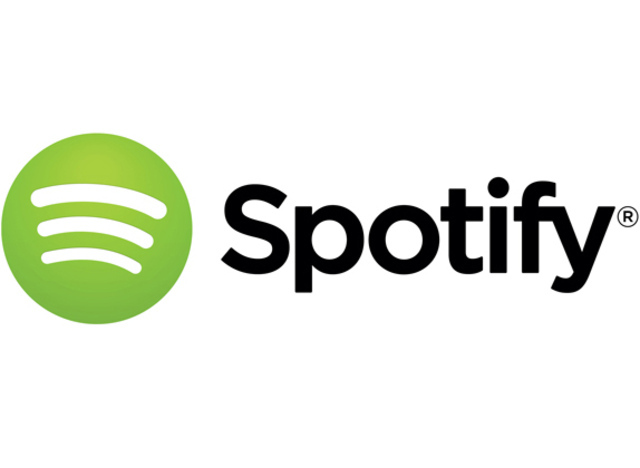 Not anymore! I plan to explore other options that the 15mm rail system gives me as well. I could see this rig being part of a system that could fully replace lugging around larger video cameras. Imorden IR-02 mounted on tripod with follow focus. Overall I’m really happy that I bought the IR-02 Shoulder Mount Rig. It was inexpensive (only $60) and has given me far more options than I originally thought that it would. I have to admit that I wish Imorden included the counterweights with the purchase of the IR-02, but that’s a minor complaint. You can pick yours up today from Amazon.com.